if you have been following my tweets, you would have seen the torrent of tweets i unleashed and gushed about the above navy peacoat with gold buttons. just a simple understated peacoat, but ever so regal with the color contrast. it looked so luxurious too. this is the reason why fashion houses should have the "buy off runway" feature. i would have bought this in a single heartbeat. i don't want to wait another 7 months for it to appear in stores. now who should i call at ferragamo to make it happen? Salvatore Ferragamo show was amazing. The white trench coat with gold buttons, and the same cut on Green-Navy are wonderful ! I can imagine why you're dying to get your hands on this piece; love the tones in the outfit too. 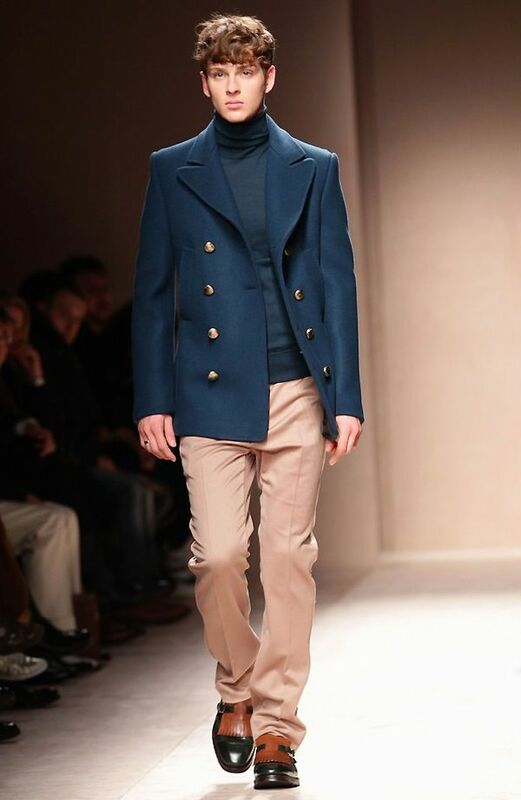 I think that Ferragamo was the BEST & most WEARABLE collection from Milan this year → Fantastic → And, great pick with the Navy Peacoat → Superb. Beautiful coat. Hadn't even checked out the Ferragamo show. Certainly will do now. I just looked at the collection before I clicked over to you, this was my favourite piece as well! The colour is so excellent. Although most of the show was pretty adorable, no? I'd been looking through the Dsquared show before..I needed something refreshing after that. Unfortunately I can't really afford to buy high fashion yet, but when I saw those Tim Hamilton x Lacoste high tops you featured a few weeks ago I found them in Bristol and bought them next day, love them!